Since a fair part of my life revolves around birding, I can’t help but apply the lifestyle to various aspects of this personal journey through time and space. For example, I sometimes wonder what things would be like if birders were in charge and birding was this highly important, sacred thing carried out by many more millions of people than it currently is. Like what if the folks in charge were all about birding and had like-minded support from the masses? Sometimes the birds on Poas can be slow. This wasn’t the case last week. Despite it being a sunny usually birdless mid-morning, we saw quite a few species including chlorophonias with nesting material, many Mountain Elaenias, Sooty Thrushes, and much more! On one of those days, we also had looks at a male quetzal. The following day, great looks were had at a Costa Rican Pygmy-Owl! Even better, we watched the small rare owl get mobbed by everything from Fiery-throated Hummingbirds to Flame-throated Warblers. 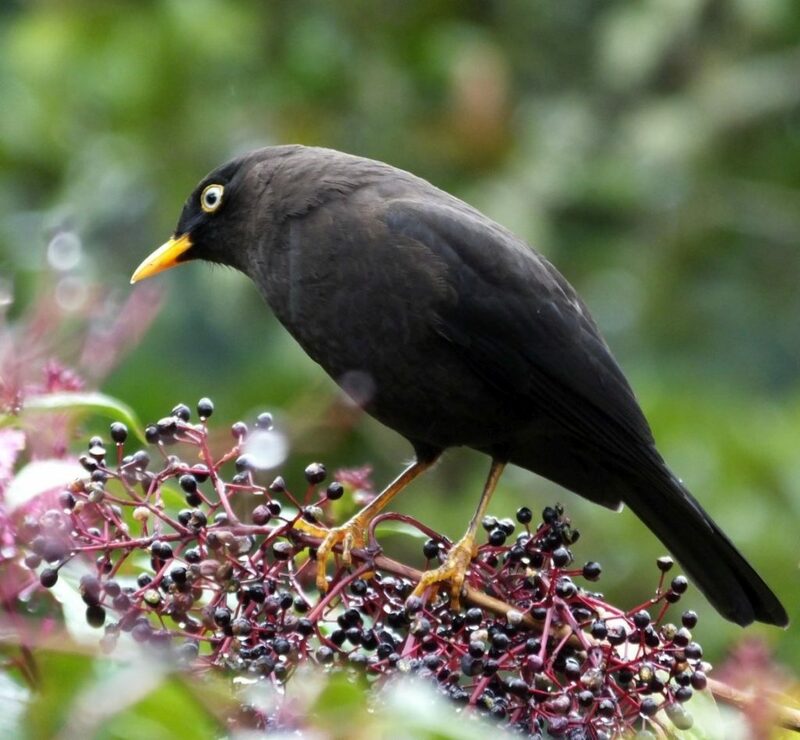 This is not just a Eurasian Blackbird with a pale eye. Speaking of small aggressive surreal creatures, very few were at Cinchona and I just don’t see nearly as many as I used to pretty much everywhere. I fear that the consistently direr conditions have had a negative effect on hummingbird populations in Costa Rica (along with several other birds). There was a similar near dearth of hummingbirds at the Freddo Fresas garden although we did manage to see Magenta-throated Woodstar. Keep an eye out for feeders and any flowering trees and please eBird your results. This hotspot is always good but as water levels continue to go down, it’s bound to be even better in February. Low waters concentrate the birds and makes it easier to see a bonanza of storks, ibis, Jabirus, and more. Go with Chambita and you also have a chance at other local specialties like Bare-crowned Antbird and crakes! 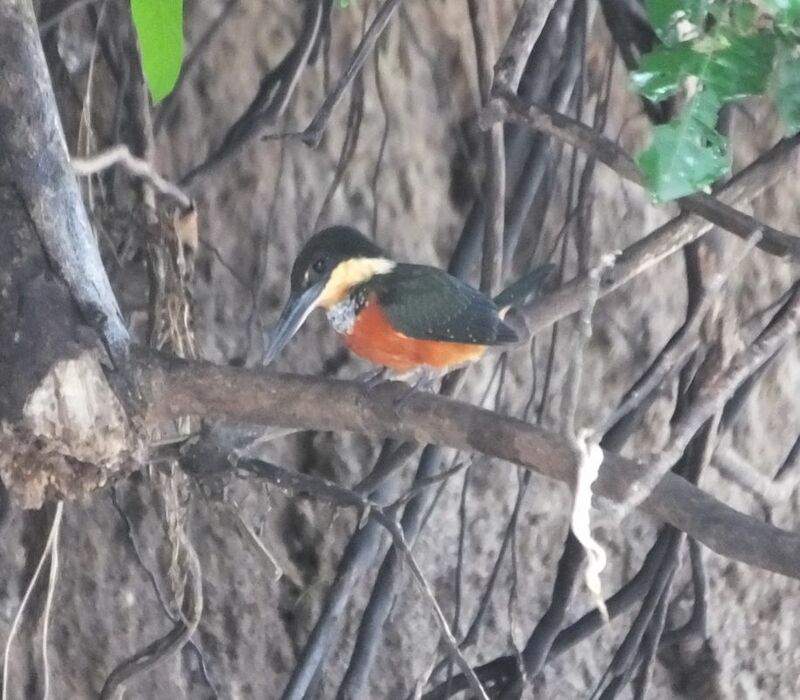 Thanks to Barnaby Romero (aka Chambita), I saw this Green and Rufous Kingfisher. Although I have yet to bird this wonderful area in 2019, others have been seeing the usual good set of species including crakes at Bogarin, umbrellabird at the Observatory Lodge, and the monklet on the Fortuna waterfall trail. The birding is always good around Fortuna! A Good Year for Cooper’s Hawks and Blue-headed Vireos? While these birds might not garner much fanfare up north, only the lucky see them in Costa Rica. They are here each winter but are always scarce. Based on the number of recent sightings, I can’t help but wonder if more are actually present this winter or if there are just more birders out in the field? In any case, I hope that Mary and I can see these and other scarce migrants on our path to 700 species in 2019. No, not my birding team, but a recent birding binge carried out by guides Meche Alpizar, Johan Fernandez, Jason Hernandez, and author Noah Strycker. On January 20th, they recorded 281 species on a trip that took them from the cold heights of Irazu to the lowlands of La Selva, then back over the mountains at Poas before heading down to the Carara area. And yes, they saw some pretty good birds along the way including their first of the day, the mega Unspotted Saw-whet Owl! There have been a few reports of bellbirds in Monteverde. It seems a bit early but perhaps because of weather conditions, at least a few are present, maybe more will show in February? 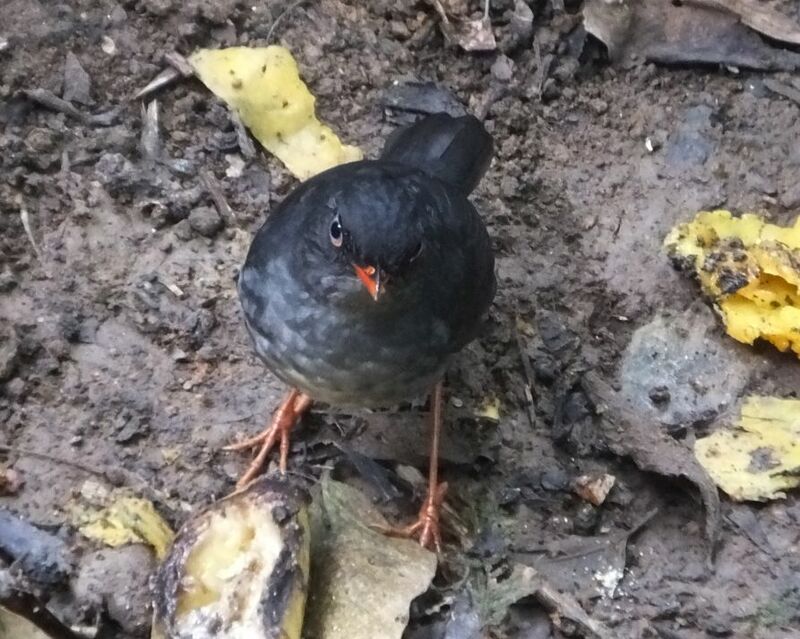 How to See, Find, and Identify Birds in Costa Rica. You can also prepare for your trip with the Costa Rica Birds Field Guide app, a digital field guide with images for more than 900 species and sounds for more than 670. Hope to see you birding in Costa Rica!